I am fond of William Blake, both his poetry and engraving work/painting. 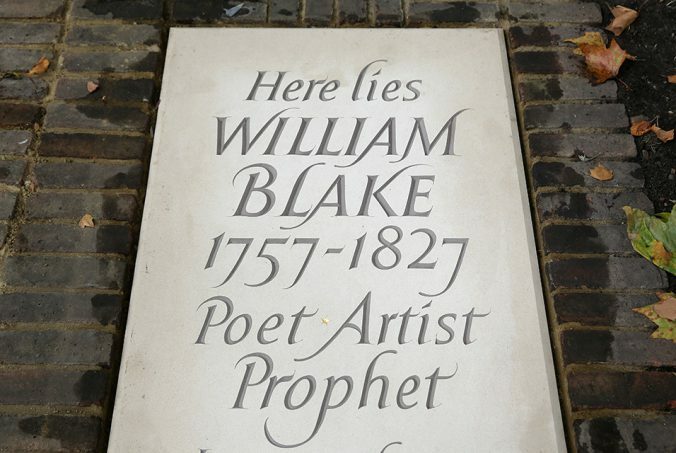 On the good side, some amateur sleuths have located the exact spot of William Blake’s grave, the original marker having been moved when the cemetery where he and his wife were buried was restored, and a portion of it turned into a park, as part of the recovery from the blitz in World War II. This is the marker that was placed after the restoration. It was placed some distance from the actual grave site. My assumption is, however, that it resembles the original grave stone, or perhaps combines the two grave stones of William and his wife. Two things stand out to me, both of which bother me at least a bit. First, and most significant: his wife is not included in the marker. 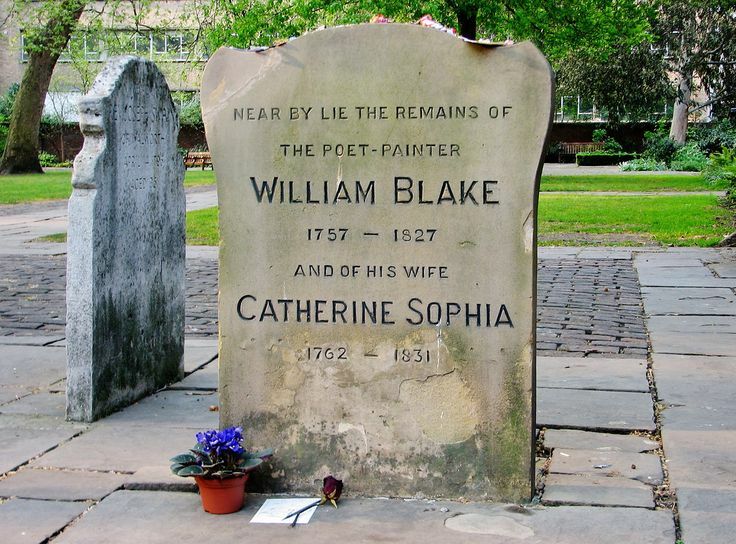 Granted, this was to honor Blake’s literary and artistic achievements, but if they found his grave, one assumes they may have also found his wife’s. Usually couples are buried close to one another, if not side by side or even in the same grave (one atop the other). The earlier marker noted that fact. It bothers me that Catherine is excluded from this one. Secondly, I know folks sometimes refer to Blake as “prophetic” because of his work and the mythos he constructed in his work. But by what authority is the title “Prophet” applied on this monument with the same certainty as poet and artist? Also, it just occurred to me: a poet is a species of artist, as is painter. The post-restoration marker was also correct in that realm as well. You can read more about the new marker and how it came about here, and here. UPDATE: Some friendly folks on Twitter pointed me to some resources that pointed out that Blake and his wife were not buried next to one another. Instead, she was buried several meters away from him. Also, the marker that was moved was evidently placed closer to the original grave site in the 1920s, while Blake’s original grave was unmarked.